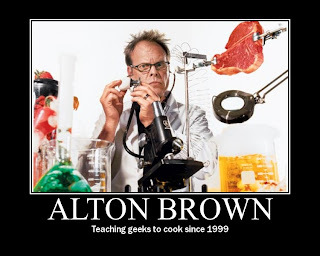 For those of you who don’t know, I love Alton Brown (aka AB). I DVR his show Good Eats and I really dig all the science behind the magic that happens in the kitchen. Then, late last year, I saw a chocolate chip cookie comparison on The Way the Cookie Crumbles. (btw, I love comparison posts!) I won’t go into the details here, but Bridget compared 4 highly rated chocolate chip cookie recipes, including AB’s “The Chewy”. And after baking 4 different kinds of chocolate chip cookies and comparing them, she recommended “The Chewy”! I knew it was a sign. With all the holiday cookie baking I did, I haven’t had a chance to get to this cookie until now. I doubled the recipe and use 1 bag of chocolate chips and 1 bag of chocolate chunks. Hubby thought the cookies were a bit too chocolatey. I say there’s no such thing. Also, AB uses a #20 portion disher. After some research, I found that is 1.6 oz or about 3 Tbsp of batter. I just used my cookie scoop which is no where near 3 Tbsp of batter. I couldn’t find any markings on my cookie scoop to indicate the portion size (FYI, the portion size indicated the number of portions per quart). Since my cookie scoop was small, I had to watch my cookies very carefully to find their appropriate baking time. After a few underbaked cookies, I decided to bake for 9 minutes at 350 degrees. These cookies are VERY good. I could eat 10 without even realizing it. I think they were better the second day. I will definitely be making these again and again. Heat oven to 375 degrees F (I baked at 350). Pour the melted butter in the mixer’s work bowl. Add the sugar and brown sugar. Cream the butter and sugars on medium speed (it should look like very thin peanut butter). Add the egg, yolk, 2 tablespoons milk and vanilla extract and mix until well combined. Slowly incorporate the flour mixture until thoroughly combined (it will look like peanut butter at this point). Stir in the chocolate chips (I used chips and chunks). Chill the dough, then scoop onto parchment-lined baking sheets, 6 cookies per sheet (12 for me since I was using a small cookie scoop). Bake for 14 minutes or until golden brown (9 minutes for me), checking the cookies after 5 minutes. Rotate the baking sheet for even browning. Cool completely and store in an airtight container. If Carlos claims this is the best thing you have ever made … I might have to make them tonight! Let me know if you do. I was seriously SHOCKED when he said that. Yeah, I can see why these are the best ever!!!! Love Samoas! I grew up calling them Samoas and didn’t like them when I was selling them, but have since grown to love them. Great twist on a traditional rice krispie treat! I can’t tell if the naming thing is regional or not. I know people who grew up in Indiana like me who call them Samoas. They’ll always be Caramel Delites to me. Sharing these in my friday link roundup! Everyone needs to see these! oh jeez. caramel de lites here, too 🙂 these sound killer! You’re the first person I’ve met who calls them Caramel de Lites too! I’ve been wondering why they aren’t always called Samoas! Are the pecans there for the Samoa flavor or just an extra addition? They add some texture but you could leave them out if you wanted. Awesome recipe! Let me provide a little insight to the naming of the cookies (Caramel deLights vs Samoas my wife is a girl scout troop leader). The girl scouts rely on a few bakeries to produce their cookies. Caramel deLights are made by one bakery, while Samoas are made by another. On Sunday nights, my hubby leads a college-age Bible study group and I use the kids/young adults as my guinea pigs for trying new recipes. I made these yesterday and they LOVED them. Thank you for the recipe! So glad these were a hit for you! This has become my most frequently made and requested recipe that I’ve made.